Questions About Growing Butternut Squash? Growing butternut squash has become a yearly tradition for many folks. That's probably because butternut squash are so easy to plant, maintain and harvest. They are also delicious to eat in a wide variety of recipes. The plants can get large and lush and feature attractive blossoms that attract bees and butterflies to your garden. There are now bush varieties available that can even be grown in containers. A typical vining butternut squash plant will produce 5-15 squash, depending on the variety. 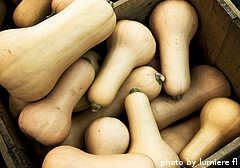 Typically, a variety that produces smaller squash will produce more of them, while varieties that produce very large squash will only support a few fruit per plant. Bush varieties typically produce fewer numbers of smaller squash. Butternut squash are planted in the late spring, after all danger of frost, when soil temps have warmed to at least 60 degrees F. They are typically harvested in the late summer. grow. Like other squash varieties, butternut squash transplants don't usually do well because they won't tolerate having their root systems disturbed. You'll need a spot that gets 6-8 hours of direct sunlight everyday. The soil should be well tilled until loose and airy to a depth of at least 8 inches. Since a typical butternut squash plant will produce several pounds of squash or more, the plant will need room to develop an expansive root system. They are also heavy feeders that thrive in nutrient-rich soil. After harvesting, butternut squash can be stored for several months in a cool spot like a root cellar. They also can be cooked and the flesh stored in the freezer for up to a year. Butternut squash are quite versatile and they can be mashed, fried, steamed, roasted, boiled, baked, stuffed and used to make soups and stews. 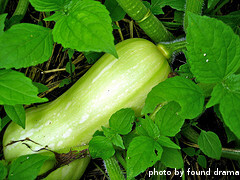 Click on the following links to learn more about growing butternut squash.